He was weary and hoarse, the ringing in his ears hard to bear. When he stood at the head of his dining room table to introduce himself, he looked at his carefully chosen guests and faltered for a long moment. As he welcomed family, friends, and others who knew his 8-year-old son to his home in Dorchester, Bill passed around a piece of paper that ended with a question printed three times in capital letters. Seven months after what he came to call “the event,” Bill and his wife, Denise, were now grappling with how to glean some meaning out of their void, some way to honor their son, the only child among the three who died on Marathon day. Bill was still recovering from a second operation to repair his blown eardrums, while Denise was learning to adapt to being blind in her right eye. Neither had much time for their own care, so pressing were the constant medical appointments for Jane, their 7-year-old daughter, who lost her left leg and was still learning to walk with a prosthesis. They also remained concerned about their older son, Henry, who at age 11 escaped the shrapnel but had to live with what he witnessed. It was the week before Thanksgiving, another looming milestone as they learned how to live on as a family of four, to use one less plate for dinner. And it was still hard, even this long after the bombings, to contemplate sharing their story beyond their closest friends and relatives. No family lost or suffered more that day. No family was more determined to defend their need for privacy against the compassionate attention of the city, indeed the world. They deflected all interview requests until, in late autumn, they agreed to meet with the Globe. But on this November night the Richards found themselves in something more like a familiar role. After years of organizing neighborhood cleanups, turkey fries, ice cream socials, pumpkin carvings, fund-raisers, and local revitalization projects, they were again mulling how to give back to the community. This time it would be far more personal. They hoped to start a foundation to build a lasting legacy for Martin, a boy who spoke out for fairness on ball fields and for peace in the streets. “I feel that the path has been opened with him holding that sign,” Bill said. “It’s his,” Father Sean Connor, the Richards’ former pastor, agreed.“Claim it.” Others at the table, including Martin’s teachers, counseled the Richards to keep the mission broad enough so Jane and Henry could shape it when they were older. In a room filled with gifts sent by strangers from around the world — quilts, flags, jerseys, stuffed animals — the discussion turned to what distinguished the Richards from others who had suffered a great tragedy, and how, their loss having occurred in such a public way, they would have to relive their experience every April. So they would have to choose whether to embrace or escape it. “We’re trying to be ready for April,” said Bill, noting that the upcoming Marathon would fall on his birthday. Would they go? It was a question they weren’t ready to answer. The answer would depend on how Jane and Henry felt about it. “You’re all here because we may decide we just want to get out of Dodge,” Bill told his guests. But they were already feeling the pressure. 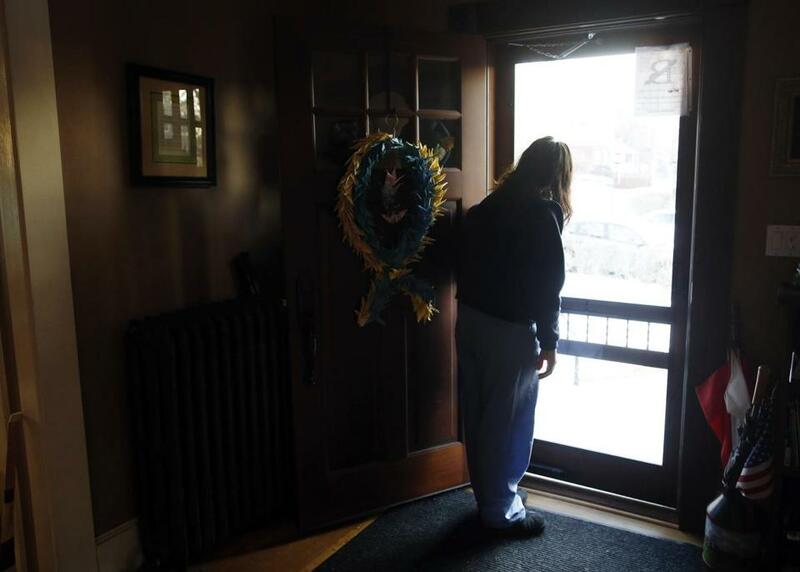 DEVASTATED BY THE ATTACK: Denise Richard lingered in the doorway as her son Henry headed off to school. 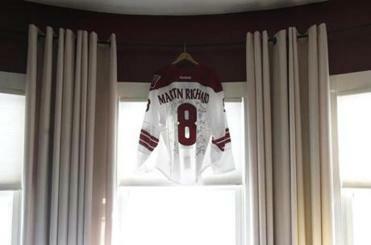 The Richards have struggled with the death of Martin and their own injuries over the past year. Last April, before everything changed, the return of spring meant more time for Martin to practice layups and slap shots in his family’s driveway, where he would drop his backpack after school and spend hours playing. Jane went from piano lessons to chorus practice to Irish step dancing classes, where she was known for her giddy enthusiasm and diligence in practicing her favorite dance, the reel. Henry focused on keeping his grades high enough to stay on the honor roll and worked with a tutor to prepare for Boston Latin School’s challenging entrance exam. For Bill and Denise, both 43, there weren’t enough hours in the day. Regimented and focused on work, Bill was constantly meeting with clients and overseeing projects for the small environmental services company in Needham he had spent years helping to run. Denise, often nose deep in a book and with a deep appreciation for irony, was organizing themed story-times as a librarian at the nearby Neighborhood House Charter School, where Martin was in the third grade and Jane was two years behind. They were a family in constant motion, a whirlwind of pickups and drop-offs, sleepovers and birthday parties, homework, community projects, coaching, and church. Their foyer was filled with cleats, hockey sticks, and baseball gloves, the walls of their house decorated with the children’s artwork and school presentations. A steady flow of neighbors stopped by, as they always did. Bill and Denise were seen as pillars in their corner of Dorchester. Bill spent years as board president of the St. Mark’s Area Main Street group, and Denise served as secretary of the Ashmont Adams Neighborhood Association. The couple had become well known for their efforts to raise money to restore the old Peabody Square clock and renovate the Ashmont T station, among other projects. In the days before school vacation, it was Silly Week at school, and Jane dressed up as Jane Goodall, with binoculars made of toilet paper rolls, and Martin went as Dustin Pedroia, his hero. Henry and Martin covered themselves in mud in a neighbor’s yard and went to scare Jane and her friends, a typical prank. 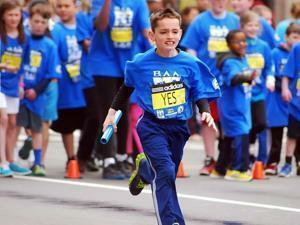 The next morning, the kids competed in the Boston Athletic Association’s annual youth relay race on Boylston Street, a prelude to the Marathon, which they had done for years. Martin took the short sprints so seriously he’d hold his fingers taut — an aerodynamic edge. On Sunday, the day before Patriots Day, Martin had baseball and street hockey. Denise and a friend took a deli platter to a neighbor whose mother had died. Bill opened a Sam Adams and settled in for a lazy day watching the Masters golf tournament. But then Martin wandered over and peered at him, his brown eyes wide. The sun had come out, and he wanted to toss a ball with his dad. After heavy persuasion, Bill relented. He rounded up a group, including Jane and Henry, and spent the afternoon playing pickle and baseball in Hemenway Park, where Martin complained if the adults let the kids win. That night, after pizza, Martin and a friend at the house were pleading for a sleepover, but Bill and Denise were tired and the family had plans the next morning. Martin and Denise walked him home. It was a glimmering night, with the stars unusually bright, and they lingered on the way back, admiring the ethereal view. Martin was studying the solar system and always looking for Venus. In his father’s fleece, the sleeves way too long, he held Denise’s hand as they walked back, leaning into his mother. “Is that the Milky Way?” he asked. In the years after they met at a keg party at Bridgewater State College, the young couple made a tradition of joining the throngs at Fenway Park who strolled to the Back Bay on Patriots Day to watch the final leg of the Boston Marathon. After their children were born, the Richards carried on the ritual of cheering on the runners, though they would spend more time in ice cream shops than bars. When they got older, their kids — all fledgling runners — marveled at the elite competitors and cheered on the stragglers, while Bill and Denise relished being part of the massive crowds, which made them and the city feel so alive. Last April, however, they thought it might be time to try something new. The Amtrak Downeaster ran up to Portland, which Martin, especially, thought would be fun. The weather was just right, and it would be a nice escape over school vacation. But in the end, Bill had too much work and couldn’t take off more than Monday. So on the morning of the Marathon, there was a tacit understanding they would head downtown. Martin was up early shooting hoops and playing hockey behind the house, while Bill and Denise scrambled to get everyone ready. After breakfast, they packed pretzels, peanut butter sandwiches, apples, and water, and offered advice on what to wear. Jane, who could sometimes dress outlandishly, was testing their patience as she searched fruitlessly for her prized Clifden Academy of Irish Dance jacket. They didn’t leave the house until after 10, and Bill was anxious to get to their regular spot on Hereford Street, worried they might miss the leaders before they turned onto Boylston. They were cutting it close. “C’mon — let’s go,” he said, as he hurried to the subway. About a half-hour later, when they arrived at the station beneath Boston Common, Bill was ready to speedwalk. But someone had to go to the bathroom, and then everyone did. Finally on their way again, Bill and Henry huffed ahead of the others through the Public Garden and down Commonwealth Avenue, more than a mile, until they made it to Hereford and realized they were too late. They had just missed the lead runners. But they were there, and happy to be. The kids wormed their way through the crowds for a better view by the barriers. They cheered for strangers heaving up the final hill, a gentle slope that feels like a mountain to many haggard runners. When they had had enough, Martin and Jane began playing a jumping game on a nearby stoop, until Jane got tired and fell asleep while leaning on Bill. Afterward, Martin began egging on his parents for ice cream. “Soon, soon,” they responded, as they craned to watch more runners surging through the final mile. Eventually, they gave in. They planned to be there for the afternoon — Denise was on her iPhone, tracking friends who were running — and they had to pace the kids. So the family made their way down Newbury Street, high-fiving foil-caped runners on the way. When they made it to Ben & Jerry’s, Martin smeared Moose Tracks on his face, laughed, and gave his family a big thumbs up. They lucked out, got a table inside, and Henry and Jane lingered over their black raspberry and cookie dough. 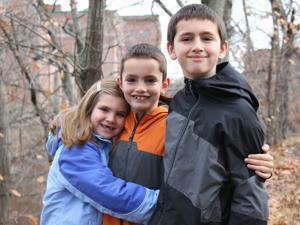 With the kids sugared up and content, Bill and Denise ushered them to Boylston Street. The crowds remained dense as many of the charity runners began slogging in after 2 p.m., and the Richards strolled along the sidewalk until they spied a slight ebb in spectators by the Forum restaurant. A couple was standing next to the barricades, but they let the kids in front of them. “Not you,” they joked with Bill and Denise, considerably taller. With the sun peeking in and out of the clouds, they searched for familiar faces as runners streamed past. At one point, between high-fiving runners, Martin asked his parents how old he had to be to run the Marathon. Denise looked at her phone, refreshed the website with the tracking information, and couldn’t believe it. They had just missed one of their friends finish. It was 2:49. Maybe it’s time to wrap it up, Bill thought. Suddenly, in the distance, they heard a deep boom and felt the ground shake. They looked to the left and saw a large plume of smoke rise a block away, near the finish line. A utility explosion, Bill thought. Denise was staring into the distance, trying to make sense of what happened. The kids were silent, more surprised than frightened. Someone in the crowd urged everyone to clear the sidewalk. “Get in the street,” the person yelled. Bill was standing behind Martin and Jane, with Denise and Henry a few feet away. They converged as the crowds pressed toward the barricades. “We should go,” Bill told Denise, as Henry retreated behind her. Then they heard a young woman shriek “Oh, my God,” and Bill realized it might be something other than a mishap in a manhole. He began to jump the barricade and planned to hoist the kids over. He wanted everyone out of there quickly. If this isn’t a utility explosion, he said to himself, there might be another. Minutes later, in an ambulance racing to Boston Children’s Hospital, Bill crouched between Jane and Henry, holding their hands. They all reeked of gunpowder. Henry had bits of shrapnel — mainly nails — in his fleece, minor burns on his legs, and trouble hearing. He was quiet and his head throbbed. Jane was in a state of shock and had burns and shrapnel all over her body. Her hair was singed. When a paramedic asked her to sit up, she saw that her left leg, below the knee, was gone. She started to scream. Bill had second- and third-degree burns on both legs and a ball bearing lodged deep in his left shin. Blood covered his shredded jeans. His sneakers were torn. He could hear only faintly. His mind filled with images too hard to bear. He felt dazed, and as the ambulance sped through the city, he repeated to himself: It happened. It happened. When the ambulance arrived at Children’s, doctors and nurses were waiting in their surgical scrubs. They had been alerted that a young girl with severe injuries was coming, and they wheeled Jane on a stretcher to the emergency room as Bill and Henry followed on foot. Afterward, Bill felt obliged to pull Henry aside in a nearby corridor. He looked at his distraught son and explained that Martin had been hurt really badly, that he didn’t make it. “Jane and Mom are OK, and we’re going to be OK,” he tried to assure Henry, who was now in tears. While they waited for Jane to get out of surgery — doctors spent hours cleaning and closing her wounds, performing blood transfusions, and removing the shrapnel that scarred nearly every part of her body — Bill made several calls. Bill also called Erin O’Brien, his sister-in-law, who had been watching the Marathon on Boylston Street with her 4-year-old daughter but left shortly before the attack. “Are you OK?” he asked, as she pulled into her driveway. Yes, she said, and you? “No, we’re not,” Bill said. John and his wife, Michelle, would be the first of many family and friends to drop everything and speed to the Richards’ side. After leaving their kids with friends and talking their way through a series of police checkpoints, they found Henry in the emergency room, where there were bloody bandages everywhere. There was fear and confusion in his eyes. Bill was in an examination room nearby, pleading with a doctor to remove the shrapnel from his leg, but refusing to be sedated. “You’re not putting me under,” he said, an edge now clear in his voice. Too many decisions lay ahead to be unconscious. The doctor couldn’t reach the embedded ball bearing without proper anesthesia, so it would have to wait. Father Sean, who was also a longtime police chaplain, heard the news from several parishioners at Saint Ann’s, where many in his flock are officers, nurses, and firefighters. He and others in the police department’s family assistance unit drove from the finish line to Beth Israel, where they found Erin and her husband, Sean. Denise was in surgery, with doctors laboring to remove a large ball bearing from her right eye. Then Father Sean went to find Bill at Children’s. Rarely at a loss for words, he wondered as he walked into the emergency room: What do you say to a man whose world had suddenly shattered? Before the surgeons moved Jane into a recovery room, an FBI agent and a Boston police officer questioned Bill in a private room. Did he notice anything? What did he remember? Could he provide a timeline? He had little to offer. When the doctors operating on Jane emerged from surgery and assured Bill that Jane was stable and that she would remain in a medically induced coma for a prolonged period, he knew he had to go see Denise. As he rode an elevator late that night to a surgical unit on the fifth floor of Beth Israel, Bill held Henry tight and steeled himself for what they would find. He knew only that Denise was being treated for an eye injury. They found her in bed in her room. The medical staff stepped out when they arrived, leaving the three to embrace, and to weep together in shock at the randomness of their tragedy: Jane grievously hurt. Martin gone. Henry almost without a scratch. Denise had a thick bandage over her eye. The ball bearing, about a third of the size of her eye, had ruptured her eyeball and damaged her optic nerve, but she had escaped any brain damage. An out-of-town surgeon would fly back to Boston to repair her retina the next day, but no matter how much the doctors tried, she would never see again in that eye, not even shadows. Bill and Denise had little time to dwell on their injuries, which seemed relatively trivial to them. Nor could they linger in sorrow. They had to rally for Jane, who remained in stable but critical condition. They had to comfort Henry, now noticeably withdrawn as relatives tried to engage him at the hospital. Most concerning to them, at the moment, was where Martin was. A police sergeant had promised Denise, before she left Boylston Street, that his officers would remain with her son at all times. John and Father Sean were now conferring with police, and Bill told them he wanted to know as soon as his son was moved. They wouldn’t learn until later that his body remained on the street until well after midnight — roughly 12 hours — because the crime scene had to be documented in minute detail. With others to stay with Denise and Henry at Beth Israel, Bill returned with Father Sean to find Jane in a recovery room at Children’s. She was unconscious, badly burned, and had a breathing tube in her mouth. It was late now. The pastor said a prayer. Bill was exhausted and numb. He wanted to change and gather what they would need for the coming days, so John drove him home to Dorchester while Michelle stayed with Jane. Inside the house, Bill was still carrying the backpack he had been wearing on the street. It was shredded by shrapnel. He began unpacking it in his kitchen, thinking, What the hell do I do with this? Do I ever want to see this again? Then he removed his shirt, which still reeked of gunpowder, and dropped it and the backpack in the trash. John went alone to Martin’s room and thought about the many Patriots and Bruins games they had watched together; Bill couldn’t join him. It would have been too much seeing his son’s flannel Celtics pajamas still on the bed, the comforter pulled up. He wanted to wait for Denise. He needed to stay focused on the moment. Bill thought it might be the last time in a while he would be home, so he gathered clothes for Henry, underwear for Denise, and importantly, Doggy and Bunny, Henry and Jane’s beloved stuffed animals. They left the house and locked the door. Bill didn’t want to return until his family could come back together. It would be summer before anyone slept there again. In the hours and days ahead, family and friends mobilized. Erin created a spreadsheet to schedule shifts to make sure someone would be at Jane’s bedside around the clock. Others helped them navigate the medical bureaucracy, take notes for them when Jane’s doctors visited, and entertain Henry with board games. They brought decent coffee and food to Bill and Denise, or, sometimes, just held their hands. They also sought to protect them. At the hospital, John emptied nearby newspaper boxes so the Richards wouldn’t have to be reminded of the attack, and Erin once threw her body in front of someone trying to snap a picture of the family. With satellite trucks encamped near the Richards’ house and media from around the world clamoring for an interview, Larry Marchese, Bill’s college roommate and a public relations strategist, helped craft a statement and worked with a local public relations firm to plead with reporters and producers from every major network to respect the family’s privacy. Twenty-four hours after the bombings, Bill’s leg began to throb. He knew he had to get the shrapnel out. When Denise fell asleep that night at Beth Israel, and knowing someone was with Jane, he reluctantly submitted to going under general anesthesia so surgeons could remove the ball bearing in his shin. Still feeling an urgent need to remain alert, his anger flared and he began to yell as the doctors at Beth Israel began putting him under. They urged him to try to relax. Over the 10 days the Richards remained at Beth Israel, the doctors and nurses understood they were treating a couple who had suffered much more than physical wounds. They gave their entourage extra space, turned off TVs in the waiting room when they entered, and looked out for them in many other ways. The orderly who brought Denise her food also offered hugs. A hospital social worker, who helped with a range of logistics, patiently heard them out as they groped with an uncertain future. Nurses cried as they combed out the blood matted in Denise’s singed hair. The hospital’s top doctors — one of whom brought them a book of poems — offered detailed explanations and set aside plenty of time to answer questions. On Bill’s 43d birthday, the staff brought a chocolate cake. Everyone on the floor signed his card. A stream of public officials also came, including the governor and Michelle Obama. Later, Jane would refuse to believe that the first lady — one of her heroes, whom she had dressed up as the previous Halloween, wearing pretend patent leather heels and an Obama pin — had spent time stroking her hair and invited her to the White House. That Friday, after the shootout in Watertown that led to the capture of Dzhokhar Tsarnaev and the death of his brother Tamerlan, Police Commissioner Edward Davis and Superintendent-in-Chief Daniel Linskey came to the hospital to deliver the news. They were brimming with emotion, especially Linskey, who told the Richards that his nephew had played on Martin’s Little League team, the Rangers. Bill and Denise weren’t following the news of the investigation, and didn’t really appreciate then the importance of it or the relevance to them. Neither were they bothered much when they learned shortly afterward that the surviving Tsarnaev had been brought to Beth Israel for treatment of his wounds. They had other concerns, especially Martin’s funeral. John called in his tailor, who visited the hospital to fit Henry and Bill for new suits. His wife went to the Richards’ house to find a dress for Denise. An eye surgeon had an optician bring Denise a large selection of glasses, because she’d lost hers on Boylston Street and could barely see with her uninjured eye. The optician drove to Rhode Island to get the prescription done in time. Father Sean offered Bill and Denise a selection of readings and songs and made many of the arrangements at the funeral home. John did his best to keep the funeral secret. He hired a coach bus to pick up family and friends at a designated location and asked the driver to surrender his cellphone. He had the flowers delivered in an unmarked vehicle and made sure police escorted the family to the cemetery. “It was the worst thing I ever had to do,” John would say later. ‘Where are we?” Jane asked groggily. After two weeks in the intensive care unit at Children’s, she had begun the slow process of waking up from her drug-induced coma. “We’re in the hospital,” her mom said. Doctors had kept her in the coma to help spare her the pain of her injuries and the multiple surgeries to clean her wounds. With Denise now discharged from Beth Israel and Bill’s leg healing — some of his hearing had returned, though the ringing in his ears was getting worse — the Richards, including Henry, and a roster of relatives and neighbors took turns holding Jane’s hand and reading stories from her favorite books. Sometimes, she squeezed their fingers when they asked if she could hear them. Her vital signs improved, and finally doctors began the long process of bringing her to consciousness. They began by removing the breathing tube from her mouth. It produced spasms of nausea, which was brutal for Bill and Denise to watch. But she was now breathing on her own, a sign that her collapsed lung was healing. Jane’s awakening brought new challenges. She grew restless and wanted to move. She became aware of the pain. When nurses changed the dressing of her many burns, it was agonizing. And then there were the inevitable questions. “Do you remember being at the Marathon?” Denise would say. In the beginning, she would often drift off to sleep after that. But as she became increasingly alert, she followed up with more difficult questions. Bill and Denise discussed with social workers how to describe what had happened. They settled on using the word “explosion.” But Jane understood, and there was no need for euphemisms. “I remember a bomb going off,” she said. At first, her parents were vague. Martin was hurt badly, they told her. The doctors tried to help him, but they couldn’t. He was hurt too badly. Each time they had the conversation, it was like the first time. And then Jane would start sobbing all over again. As concerned as everyone was about Jane, her injuries were plain to see. 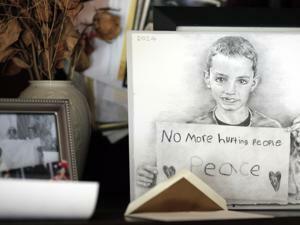 Henry, a reserved fifth-grader, was known as the quiet one before the attack. Now, Bill and Denise worried about their son, and what he carried inside. 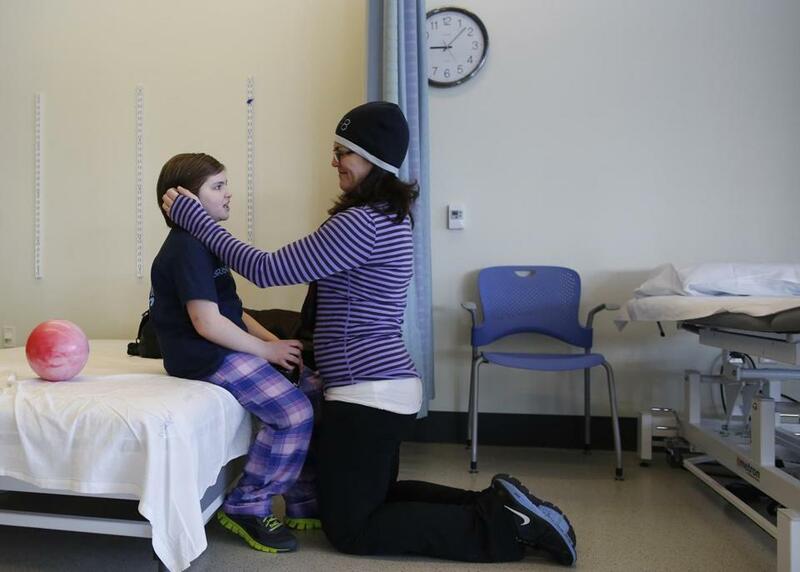 For nearly two weeks he had been living at hospitals, shadowing his parents. Now, they decided, it would be best for him if he returned to school. Bill met with the principal and other administrators at Boston Collegiate Charter School, who offered to allow Henry to take breaks during the day or keep something on his desk to signal when he needed to step out. A few weeks later, his parents even allowed Henry to spend three nights away — his first time at anything like a sleepaway camp — at The Farm School in Athol. A teacher on the trip texted the Richards updates and photos as Henry learned about life on a farm. Henry seemed to be readjusting well, but his parents remained vigilant about potential triggers for the trauma he had experienced. They also worried how it affected him to see them cry, which they were increasingly prone to do, especially Bill. For his part, Henry’s main concern seemed to be keeping up with his homework. Bill and Denise had to convince him that it was OK to put off some of his reading and math problems. His teachers cut him slack. After they left Beth Israel, Bill and Henry began staying at a hotel beside Children’s, allowing Henry to spend more time with his sister, whom he insisted on seeing every day, even if she was asleep. He continued to read her stories, caress her, try to make her laugh, and swab her chapped lips to keep them moist, even when her condition took a frightening turn for the worse. Several days after she awoke from the coma, Jane’s white blood cell counts spiked and her temperature climbed to 102. Her doctors found a fungus in her wounded leg, a potentially life-threatening development that sparked concerns it could spread to her bloodstream. To excise the infection, they began discussing a more aggressive amputation — to above the knee, but that would have meant significantly less mobility for Jane. The next 10 days were harrowing. The doctors added an antifungal medication to her already powerful drug regimen.They also brought in a special piece of equipment called a wound vacuum, which was rarely used outside military hospitals. Jane’s nurses had to learn how to operate it, and they once had to call tech support to ensure that the machine properly flushed her wounds. There were more surgeries as doctors battled the infection, each lasting between two to three hours. But by the middle of May, the infection had retreated. Jane was gaining strength again. She began to take more interest in the professional clowns who sometimes stopped by her room and sang her favorite songs. A music therapist used a keyboard to help her play simple songs, and she had more energy to devote to speech therapy to help her retrieve words she struggled to recall. Jane also started to take notice of all the gifts filling her room that people had sent from around the world — teddy bears, quilts, chocolates, candy, toys, and a lot of Boston Strong paraphernalia. Soon, she was well enough to get fresh air and accompanied her family and nurses to Prouty Garden, a peaceful patch of green between the hospital buildings where the Richards found some solace. After 39 days at Children’s, Jane had survived 14 operations, the last of which included skin grafts from the sides of her thighs to cover her limb and prepare it for a prosthesis. There were other signs of recovery. Her hair, eyebrows, and eyelashes, much of which had been burned, were growing back. In her last days at the hospital, finally able to wear her own clothes again, Jane drew cheers when a physical therapist helped ease her off the side of her bed and she stood up for the first time. The next day, she took several steps while holding parallel bars, at the end high-fiving her reflection in a nearby mirror. It was a sparkling morning in June, the day Martin would have turned 9. Denise and Bill had decided to hold a memorial Mass at St. Ann’s for their son, which allowed them to thank many people at once for all the support. It was also a chance for Jane to say goodbye to her brother. They were so close that she wore his clothes, played baseball and basketball with him. They shared slushies and sometimes even danced together. She regarded him as the best dancer in the family. For the first time in nearly two months, Jane would be outside a hospital and see a lot of friends and neighbors, many of whom longed to hug her. Some 800 people packed the pews, while others stood where there was space. The children’s choir sang. Martin’s friends and Henry read from the liturgy. Police and public officials sat in the first rows, and there were prayers said for the bombing victims and first responders. When Father Sean went to the pulpit to introduce Bill, the silence was thick. Bill was comfortable speaking in public, but this was entirely different, especially after weeks of intensely guarding his family’s privacy. He asked Father Sean to stay near, in case he had to stop, in case he couldn’t hold it together. 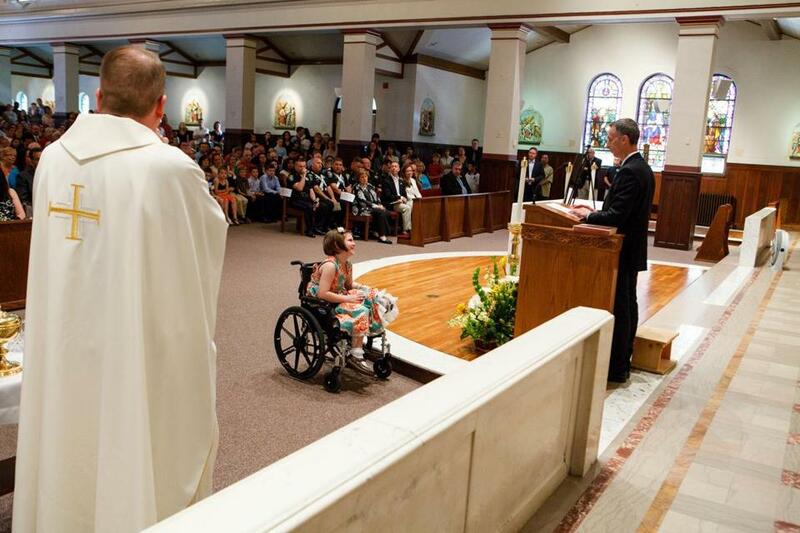 With his hearing limited, Bill wasn’t sure, at first, if anyone could hear him, except Jane, who sat in her wheelchair beside the pulpit, making funny faces at her father. It was clear that whatever damage the bomb did, it had not changed her character, her sweet giddiness. Bill spoke about how full of life Martin was, how much he enjoyed being with friends, how he was always willing to smooch his mom in public and tell his parents he loved them. He described how Martin always looked out for Jane, sometimes letting her win a game of 21 on the basketball court. Or how incredulous Martin was when Henry spent a day off from school reading a book. He spoke of who his son might have become: a hockey goalie or mayor, a charmer and storyteller, a coach and a dad. Maybe even a marathon runner. As cheated by fate as he felt, he spoke of how grateful he was for what they had left and for all the love from family and friends. “We’re going to be OK,” he reassured the congregation, though he wasn’t quite ready to believe it. A SMILE PARTS THE CLOUDS: As Bill Richard stepped up to the pulpit during a memorial Mass for Martin in June, Jane made funny faces at her father while he spoke. 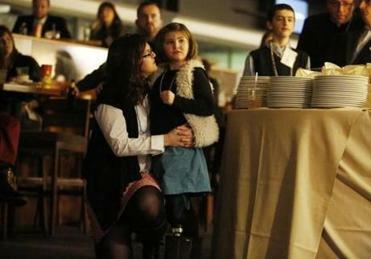 An ambulance brought Jane to the gleaming Spaulding Rehabilitation Hospital in Charlestown. There, the Richards felt like they could breathe more easily, that the intensity of the previous weeks had begun to give way to something that, by comparison, felt almost normal. The cacophony of beeps and buzzers in intensive care was gone, and from the broad windows of Spaulding, they could watch sailboats glide across Boston Harbor. Using a walker, Jane was now out of bed, spending hours in physical therapy and speech therapy and having meals with other young patients. There were arts and crafts projects with clay and putty, even an occasional party. She was eating ice cream every day to gain weight. It almost felt like camp. But there was grueling work. 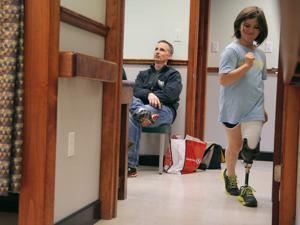 She had to learn again how to get out of bed, brush her teeth, shower, dress, and use the bathroom — all with one leg. Relieved of the necessity of always being at Jane’s bedside, Bill and Denise had time for themselves. Bill took walks around Jamaica Pond with his boss, who told him to take the year off and continued to pay his salary. So long focused on work, he now rented bicycles with Henry and brought him back to soccer, where his son scored his team’s first goal. It felt, as the ball hit the net, like a kind of divine intervention. And it eased one of Bill’s first outings back into the community. There were awkward encounters. Some acquaintances weren’t sure what to say to Bill and kept their distance; others came up and asked questions he wasn’t prepared to answer. Denise took long walks along the waterfront and had lunch with friends and relatives who came to visit. She began reading again, using a Kindle to make the type larger. At one point, she even went for a run. As she loped across what seemed to be a straightforward, flat path, she missed seeing a low-hanging branch and smacked into it. She smarted at the pain but also chuckled at the slapstick randomness of it. It was a lesson in her new visual limitations, but also a reminder that her old quick-to-laugh self was still inside. Summer neared, and the staff at Spaulding prepared Jane for her return home. The Richards began to spend more time together outside the hospital. At first, that meant getting smoothies at a nearby cafe. Then they all went to dinner at a Mexican restaurant near the hospital. After dinner that night, they went for ice cream. As they sat outside enjoying the warm evening, there was a sudden boom in the distance, a deep, percussive thud that sounded just like the first blast near the finish line. It was the USS Constitution, docked nearby, firing a cannon. “How do you know?” Jane asked. But the words seemed hollow, and they took Jane back to the hospital. Part two: The Richards return home. 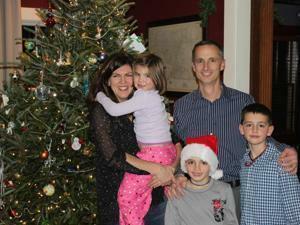 TOGETHER ON THE PATH TO RECOVERY: The Richards brought Jane to Spaulding Rehabilitation Hospital in Charlestown. The change of scenery was a welcome relief from the many buzzers and beeps of intensive care.